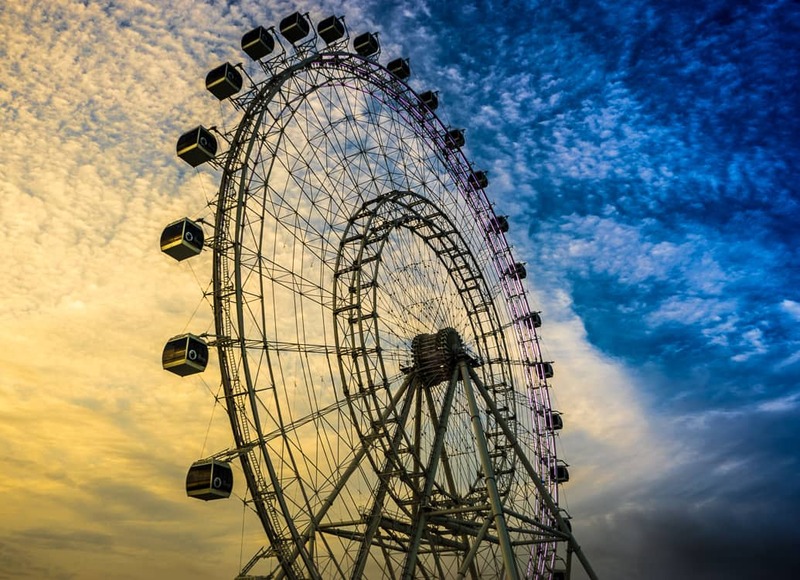 Lately, however, Orlando is beginning to look more like “The City Growing,” as International Drive is gaining steam as the newest amusement hub – and, arguably, the biggest thing to hit I-Drive is The Orlando Eye. As we approach the final countdown to opening day, there are a few things you should know about Orlando’s next big thing. The Orlando Eye serves as the anchoring focal point of the new I-Drive 360 complex, which will be home to a variety of shops, restaurants, and attractions. Already open, Carrabba’s, Yard House, Outback Steakhouse, and Tin Roof are serving as introductory ambassadors to the new development. Tin Roof is a great spot for food, drinks, and live music. Delicious dessert options will soon be available at Sugar Factory and Ben & Jerry’s, while McFadden’s Saloon and Cowgirls Rockbar will share in the nightlife spotlight. 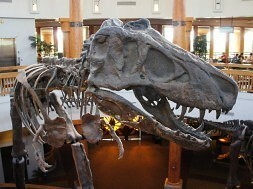 Coming attractions include Skeletons: Animals Unveiled, Sea Life Orlando Aquarium, and Madame Tussauds Orlando. There will be no shortage of options at I-Drive 360, and parking is available for free at the site’s sizable garage. 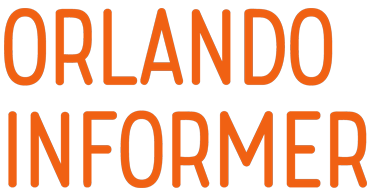 The companies behind I-Drive 360 and The Orlando Eye are Unicorp National Development, Inc. and Merlin Entertainments. Unicorp is the Dr. Phillips-based company behind the Dellagio complex and the recently-announced, 420-foot-tall StarFlyer attraction, which is slated to debut in 2016. 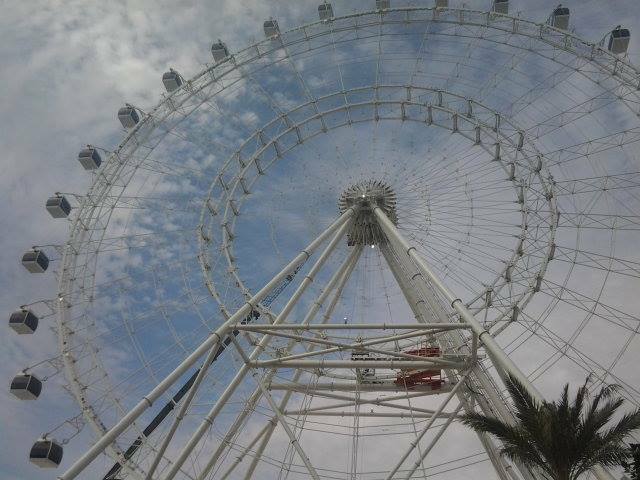 The Orlando Eye looms at 400 feet. 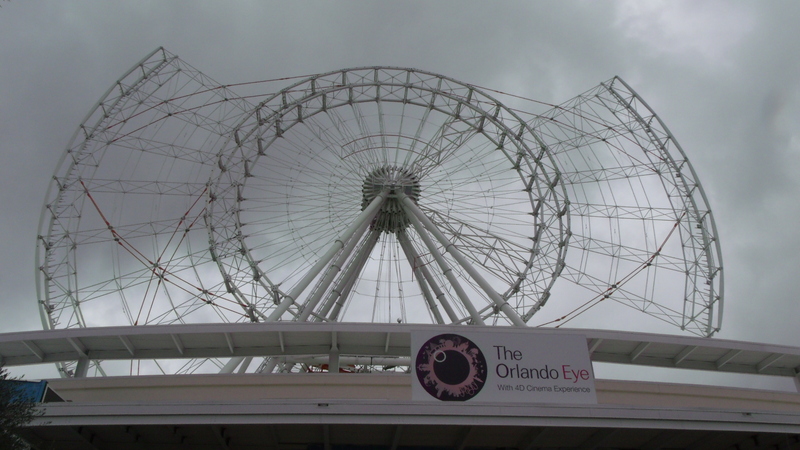 The general manager of The Orlando Eye, Robin Goodchild, is the former head of operations at The London Eye. 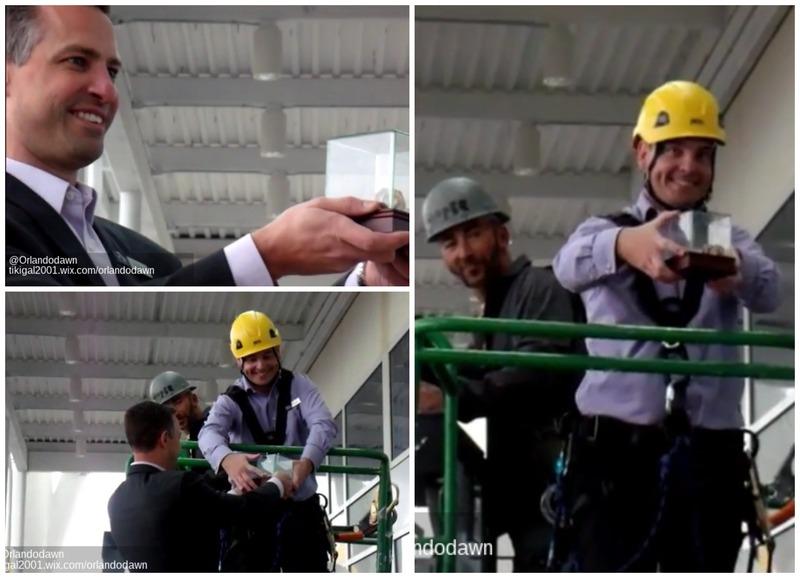 He has been on-hand for all of the recent progress at the site and received the honor of adding the “golden bolt” for the installation of the final passenger capsule on Thursday, February 5. Robin Goodchild installs the “golden bolt” to attach the final passenger capsule. The thing Goodchild is most anxious to share when The Orlando Eye opens, he has said, is the view of a Florida sunset from high above the ground. He recently experienced a preview from the roof of the offices there, and he marveled at the beauty of it. The Eye will more than double that vantage point and Goodchild is eager to soak it all in – as am I. 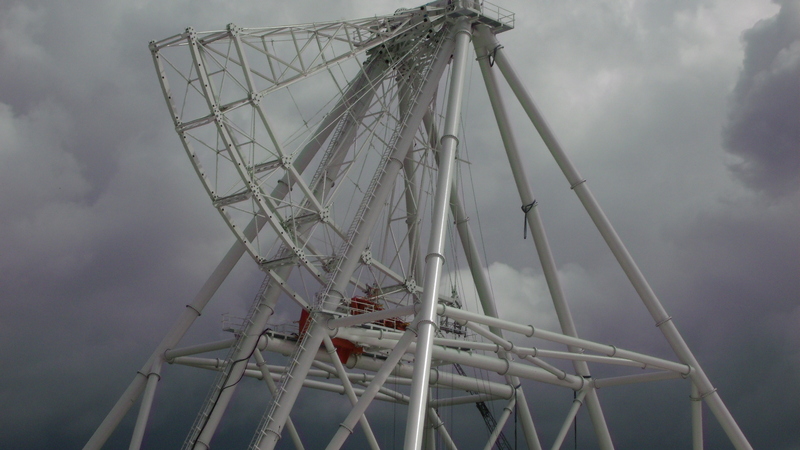 Though the planning phase of the mammoth Ferris wheel began in 2011, construction did not begin until late 2013 – after all, a project of this magnitude is no small feat. The Orlando Eye is starting to take shape. Over the second half of 2014, the Eye truly started taking shape, and progress has continued at an impressive speed ever since: on January 20, the first passenger capsule was installed; on February 5, the 30th – and final – capsule was attached. Crews are now working to complete the boarding platform, where visitors will load and unload from the observation wheel. LED lighting connections are also being added at this time. The outer wheel begins to form. Goodchild was pleased to report that they’ve encountered very few setbacks on their journey. 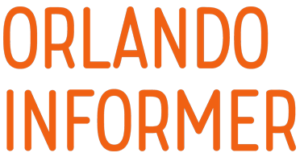 The one thing that did pose a challenge should come as no surprise to anyone familiar with Orlando: unpredictable weather. 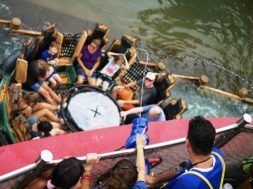 Each of the 30 passenger capsules will feature a center bench, along with room to move about the vehicle for up to 15 guests. 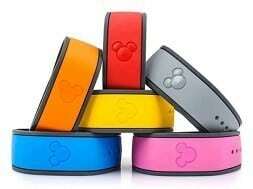 Additionally, they will be temperature-controlled and feature lighting and audio enhancements. The passenger capsules will feature high-tech perks. Touchscreen tablets will be mounted in each capsule to provide information on the surrounding sights for on-board guests. The wheel will travel at about 1 mph, taking approximately 20 minutes to complete a full rotation. 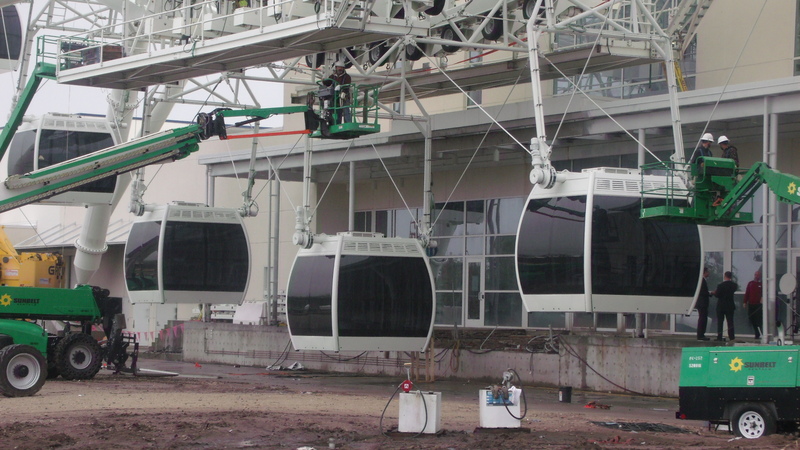 All 30 capsules are now installed. 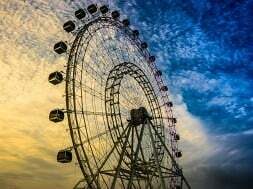 The Orlando Eye will also be available for “buy-out” events and parties. Champagne flights and private capsules will be possible, as well. 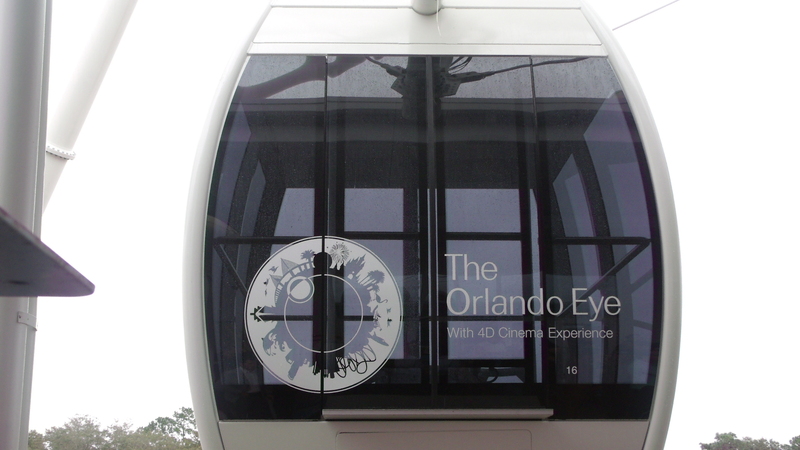 The flight experience is only part of the complete package at The Orlando Eye. Prior to a spin on the wheel, guests will enjoy a brief, 4D film preview. 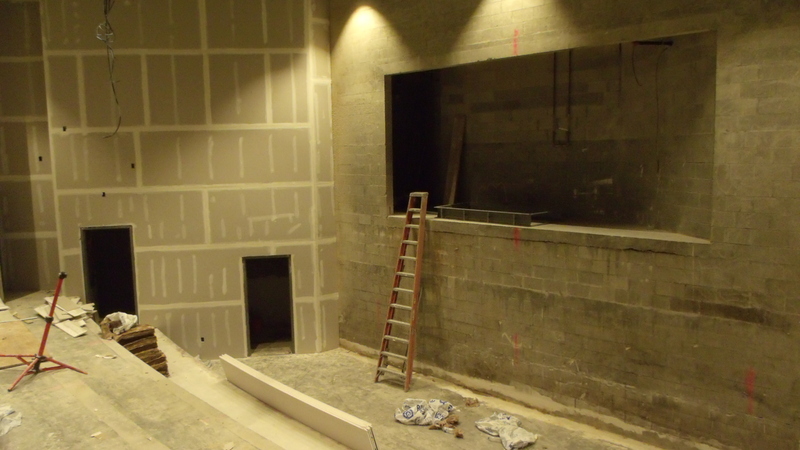 The 4-D pre-flight experience theater, during construction. There will also be opportunities for fun, green-screen-enhanced souvenir photos. The “Terminal Building” will contain a food court and lounge, directly beneath the Ferris wheel, with surreal views from below the glass ceiling. The grounds of the I-Drive 360 complex will provide an extension of the overall experience with a centralized, colorfully-lit fountain dancing to a themed soundtrack. The expansive surrounding landscape is lush and inviting – perfect for a midday picnic. 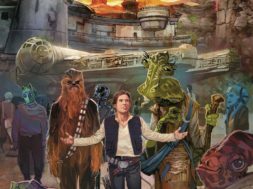 While Orlando’s theme parks will always be the thing that put the city on every tourist’s vacation map, there is no reason to limit a visit to the parks alone. With the growth of International Drive and the potential of I-Drive 360, specifically, there’s more reason than ever to stay and play for an extra day. As progress continues, it’s clear to see that I-Drive is fast becoming an amusement opportunity that’s hard to overlook; after all, it’s impossible to ignore the appeal of the “Eye” in the sky. 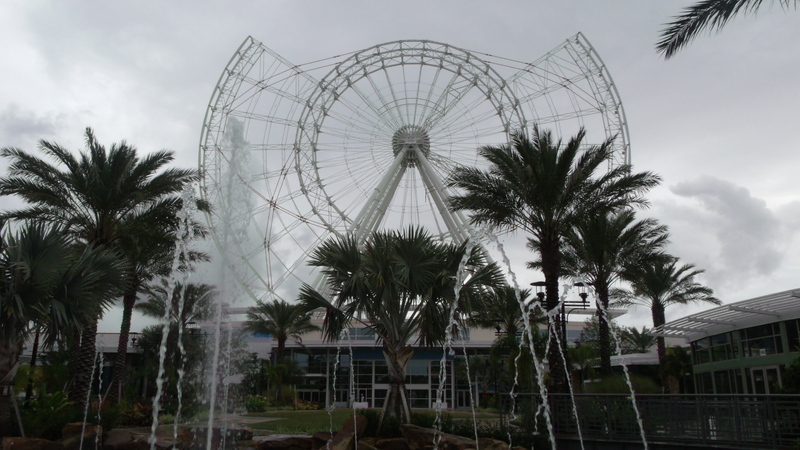 Will you be visiting I-Drive 360 or riding the Orlando Eye? Or does the whole undertaking fail to catch your eye (and hard-earned vacation dollar)? 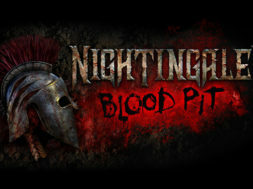 The comments await below. 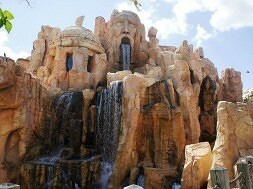 next Rapids ride at Universal's new water park?